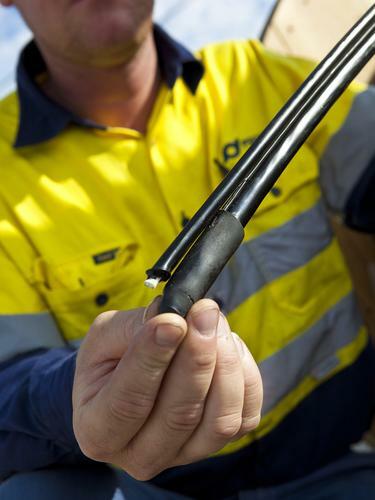 Some of the first customers and ISPs to use the fledging National Broadband Network fibre rollout in Tasmania have praised the network in promotional videos distributed last week by NBN Co as part of the infrastructure's official launch. "We'd already decided we would sign up, which we couldn't see why you wouldn't do that, especially if this was going to go national," one elderly lady said. "It's so fast, you can have all sorts of things open at the same time. Uploading to something like Facebook, I uploaded 60 photos last night from Cradle Mountain. It took me two minutes." Another couple said they downloaded "16 packages" from four computers at once, just to test the limits of the fibre cable. "That 16 was as far as we got, because everything just keep on downloading so fast, we had to look for bigger things to download," one of the pair said. Another, geekier customer - who appeared to browse gaming site Kotaku on his PC - said they had spent several hundred US dollars buying 55Gb worth of games, which downloaded overnight. "Yeah, I was quite happy," he grinned. ISPs also praised the NBN. "We were very proud to be one of the first RSPs on the NBN. We think this is a tremendously important thing to be involved with," Internode managing director Simon Hackett said. Once people used the NBN, he said, they discovered that the Internet was in fact "a much more interesting place" when it was faster, and that Australia could expect a lot more applications to turn up that would be built to rely on the new speeds. "Suddenly, the lowest common denominator is the highest common denominator as well," he said. "That's the deep thing. That's what makes everything just sizzle. This is so much the right answer in terms of being able to build a future-proof, set of ways to access the internet in Australia." iiNet chief executive, Michael Malone, said the ISP was "delighted" to be part of the launch in the early days, to iron out bugs and get some experience. "This is almost an ideal situation, where the wholesaler, NBN Co, the retailers like iiNet and the customers are all motivated to work together to make this work," he said. And Primus chief, Ravi Bhatia, said it was a "great achievement" by NBN Tasmania that the initial network rollout had taken "months, not years": "The experience so far has been simply fantastic. We didn't expect it to be simply flawless, and it turned out to be. I don't know what the limits are. The only limits will be, probably, our imagination." The future of the NBN, however, is very much up in the air. The Opposition has pledged to shut down NBN Co if it takes power in Saturday's Federal Election, and sell the assets to the telecommunications sector. Its own broadband policy has been widely criticised by the industry and other segments of the community such as big business. On the other side, debate also exists on whether the NBN is a more costly asset than Australia can afford, as Opposition Leader, Tony Abbott, has claimed. NBN Co also produced two other videos - one with NBN Tasmania chief, Doug Campbell, discussing the genesis of the network in Tasmania. Another was played when Prime Minister, Julia Gillard, Communications Minister, Stephen Conroy, and Tasmanian Premier, David Bartlett, officially launched the network in Tasmania.